(Logan, UT ) Altra’s newest international Elite Team athlete Jordi Gamito won the 2018 Everest Trail Race—a six-stage event through the mountains of Nepal—with a finish time of 21:43:45. 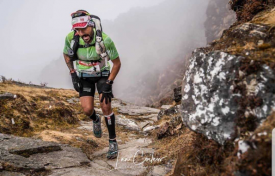 Gamito, 36, is an ultrarunner from Spain with a long list of accomplishments at international races. In 2018, he was second at Ultra Trail World Tour, third at Ultra-Trail du Mont-Blanc , third at Ultra Pirineu and third at Madeira Island Ultra-Trail. The Everest Trail Race is a self-supported foot race with six stages covering 160 km (100 miles) in the Himalayas of Nepal. The technical course is divided into six days where participants cover approximately 22 km, 24 km, 37 km, 28 km, 20 km and 30 km, respectively, with an elevation change of 29,000 m (95,000 feet). Gamito ran to victory in the Altra Olympus 3. Stay updated on Jordi Gamito’s accomplishments, along with all of Altra’s Elite and Red Team athletes by following the Team Altra Facebook Page.